CHITUK POOLS, LTD has been servicing and installing in-ground vinyl - lined swimming pools on the North Fork of Long Island since 1991. I, Gene Chituk, personally have been in the pool business for over 35 years. With years of experience under our belt and thousands of satisfied customers...Let us work with you to design and install an in-ground swimming pool to suit all your family's needs and expectations! We are a family-owned and operated business who complete all stages of your pool project including designing, building, installing, servicing and maintaining. You will be enjoying your pool in no time! I am recognized by the APSP as a Certified Building Professional (CBP) and a Certified Service Professional (CSP) and by the National Swimming Pool Foundation (NSPF) as a Certified Pool Operator (CPO). WHAT IS THE GENERAL PROCESS FOR INSTALLING A NEW POOL? 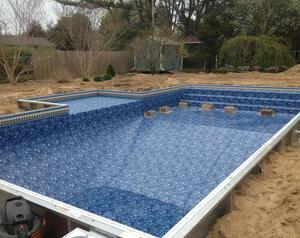 All our pools are dug and installed by owner, Gene Chituk. Once I have evaluated the site to make sure it's safe for you and my crew...then we discuss what size/shape/style pool you would like. After you accept the estimate for the job and we get approval and permits by the town, I bring my equipment on site to start construction. We dig and shape the hole, put up the steel walls and concrete them in place. Then we add foam to pad the walls and trowel the bottom with sand for cushion. Finally, we install the liner you chose, fill the pool and put up a temporary fence for safety as well as run lines for electric and plumbing. See animation for general process here. We currently do not provide patio or landscaping services. We will instruct you of proper pool maintenance, if so desired, or we will maintain the pool for you with weekly servicing, vacuuming and balancing the proper chemical levels. 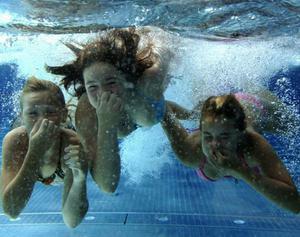 We will then close/open your pool each season at your request. Call or fill out the online request for pricing of services and for estimates.